The Alvarez Organic Farm crew will be at Ballard Farmers Market this Sunday with their asparagus, dried peppers, red onions, beans, and shallots. caught in a sustainable manner. They base their business on troll caught albacore and constantly test their catch to assure the product they bring to you is the healthiest and best ecological choice for the finest you can eat. This albacore tuna, whether flash frozen, smoked, or canned has received the stamps of approval by Seafood Watch, Dolphin Safe and New Pacific Albacore. Organic asparagus from Alvarez Organic Farms. Copyright by Zachary D, Lyons. Now for preparation: Set Oven to 425 degrees. Line a large, rimmed baking sheet with foil. Use 2 if you need it. In a large bowl, toss all ingredients until vegetables are coated with oil. Add EVOO if needed. Spread evenly on baking sheet and roast 20 to 25 minutes stirring once until vegetables are slightly charred and tender. NOTE: If you want a dinner fit for a grand banquet, use one of the albacore filets or steaks that Joyce brings frozen from the F/V St. Jude latest catch, instead of their canned products . It thaws in a very short time, slices into 1/2 inch pieces easily, and should not be cooked very long. So wait until after you stir the veggies then add the slices to the pan & sear until just before they turn from pink to white. Serve with soy sauce and wasabi on the table, or not, as you please. Servings are less than 150 calories per serving and HUGE in taste. A dessert designed by Linda Harkness, the Firefly Kitchen manager, would be absolutely perfect for the end of a lovely albacore, asparagus and morel dinner. Carrot Bars with Carrot Cream Frosting. Paul Beverage of Wilridge Winery. The only winery in the City of Seattle. Paul Beveridge, and his wife, Lysle Wilhelmi, are the owners of Wilridge Winery. (Yes, that is his name). They also own their own vineyard on Naches Heights, near Yakima, where the vines are tended organically and biodynamically. Paul and Lysle opened a European-style bistro in the early 1990’s, in a house on 34th Ave, in the Madrona district. The restaurant was on the 2nd floor and their winery was in the cellar. It was the city of Seattle’s 1st winery. After the restaurant was closed because of laws that were established to prohibit ‘bathtub’ gin being sold in a retail outlet, including restaurants, the couple decided to close the Bistro. Paul and Lysle were pioneers again by working to get that law changed, with help from the Washington Wine Institute. Paul also contributed significant time and efforts that led to the legislation that allows wine and beer from Washington producers to be sold at farmers markets. And, if that isn’t enough pioneering, they have also been among the first wineries, let along retailers, to offer their fine wines in refillable bottles. Devine Tonics from Firefly Kitchens. Copyright by Zachary D. Lyons. 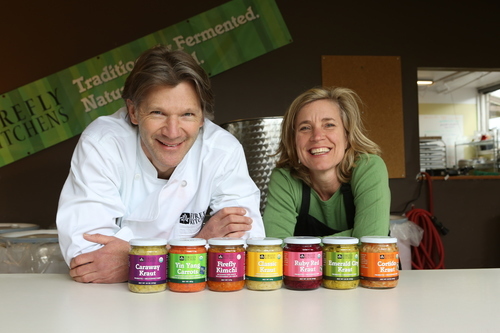 Located in Ballard, Julie O’Brien is brewing up fermented produce, much of which is sourced directly from our local farms, and is available right here at the Ballard Farmers Market. During this work, they develop a tonic they call Divine Brine. Bring your own jar and she’ll fill it up for you with some of this healthy probiotic tonic. This is not only a super-healthy food for your digestive system, it is a culinary treat for your whole body. A winner of America’s Good Food Award for each of the past 4 years, stop by Firefly Kitchens to taste. They also encourage you to bring your own jar for a fill-up of their Devine Brine. And try the recipe for Carrot Cake with Carrot Cream Icing (link is above). Super Bowl Sunday, February 1st: We’re Open! Go Hawks! The 12th Sheep from Glendale Shepherd at Ballard Farmers Market. Copyright Zachary D. Lyons. #12 Super Bowl Cheese Plate from Samish Bay Cheese. Photo courtesy Samish Bay Cheese. (Larger portions than the #12 plate: Choose three of the following, while supplies last): Ladysmith, Aged Ladysmith, Chive Ladysmith, Arugula Ladysmith, Queso Jalapeño, Queso Diablo, or Queso Seco. Some of the biggest 12s amongst our Seahawks crazy vendors are the folks from Wilson Fish. 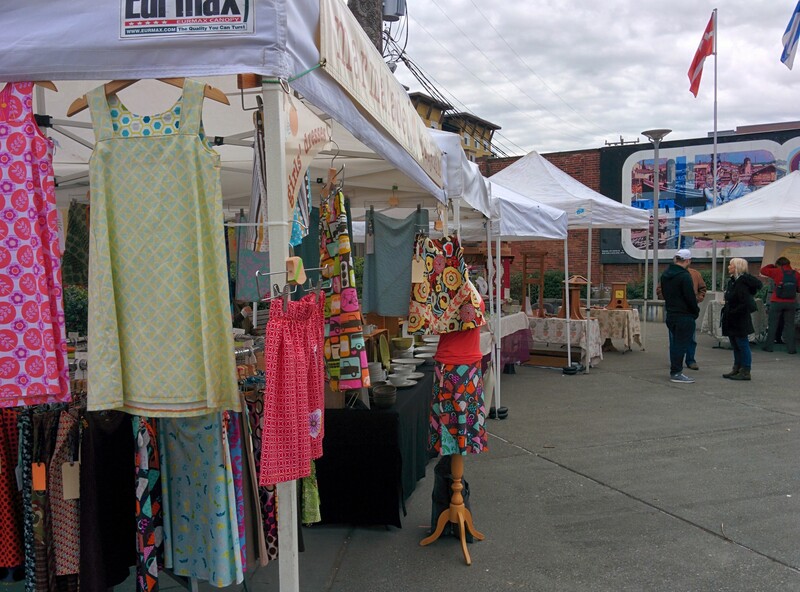 There is no place they’d rather be on Sunday than watching the Hawks play… well, except right here at your Ballard Farmers Market, where they hook you up with fish while listening to the game on the radio. Why not honor their commitment and sacrifice by serving your Big Game party guests one of their sides of smoked King salmon! Eaglemount Red Wine defies gravityat Ballard Farmers Market! Copyright Zachary D. Lyons. Some local wine and cider from Eaglemount Wine & Cider will certainly endear you to your hosts when you show up to their house to watch Seattle pummel New England today. Sweet potato chips from Lyall Farms at Ballard Farmers Market. Copyright Zachary D. Lyons. How’s about some yummy sweet potato chips from Lyall Farms? What a delicious, healthy and local way to par-tay today, wouldn’t you say? Baba ghanoush from Uncle Eyal’s. Photo courtesy Uncle Eyal’s. Uncle Eyal’s has stocked up on all of their great dips and sauces today at your Ballard Farmers Market. So grab some mint sauce, some hummus or some baba ghanoush for an awesome game day spread! Olive fougasse from Tall Grass Bakeryat Ballard Farmers Market. Copyright Zachary D. Lyons. Spicy fermented pickles from Britt’s Pickles. Photo courtesy Britt’s. Some naturally-barrel fermented pickles from Britt’s Pickles are also great additions to your party spread. And you can’t rock sausage much harder than with their various krauts. And if you need those sausages still, Sea Breeze Farm will have a healthy supply of their farm-fresh links today in a wonderful variety of flavors. For the kids, an alternative to booze and a mixer for cocktails, grab a growler or three of fresh soda from Soda Jerk Soda. The 12th Brownie from Nuflours Gluten-Free Bakeryat Ballard Farmers Market. Copyright Zachary D. Lyons. Looking for gluten-free goodies? Stop by Nuflours Gluten-free Bakery for these gluten-free 12th brownies! Blooming succulents from Phocas Farmsat Ballard Farmers Market. Copyright Zachary D. Lyons. 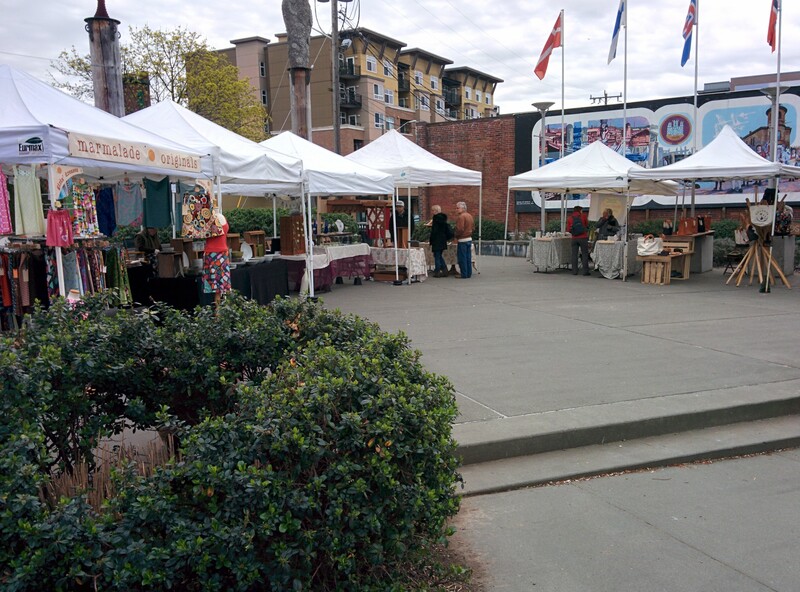 And last, but by no means least, we welcome back Phocas Farms to your Ballard Farmers Market for 2015. Jimmy returns with a great variety of succulents at a perfect time of year to get them in the ground, so they will thrive all summer. And if we’re lucky, he may also have a few packets of local saffron, too!